A long journey begins with the first step we take. When the chosen path and the goal we want to reach are right, our journey of life become fruitful. How can we choose the path we have to traverse when we are not sure of the goal we have to reach? Once the right path is chosen, reaching the destination is certain. If not today, it will be tomorrow that we will reach the goal. God will incarnate on the Earth in human form to show the right direction to people who have lost a sense of direction and aimlessly groping in darkness of ignorance. Thus, Sri Sainath Maharaj is such a divine form descended on the Earth. We need to get adapted to the changing times. Even our ideas must be attuned to our changing trends. We need to clearly articulate what exactly we want to achieve and accordingly choose the means. We can move ahead only by sighting the ups and downs, thorns and bushes on our way. For that, Baba incarnated on the earth and gave His message through His deeds and showed the right path to mankind. The path trod by Baba is the path of right conduct trod by many a sage. Let us bow and follow the foot-steps of Baba to make a path for ourselves and move on that by motivating others too. Our life gets blessed when we reach the destination resonating to the rhythm of life and always remembering Sai. God is all pervading. He dwells in every being. But only in a few that divinity is openly visible. The reason is that the blessed souls were freed from several impurities in order to manifest that divinity. It is the tendency of human nature to accumulate all and sundry things and having done so, one simply ignores their utility. A house gets jam-packed with unwanted articles. Likewise, our minds too get cluttered up with unwanted thoughts and there will be no scope for right thoughts. Then how come there be a place to think of God? Therefore, man must make his mind as empty as a hollow flute. An ordinary bamboo becomes a flute on removing its core substance. Likewise, a man can produce heavenly music like a flute by getting purified. God dwells in a pure heart. He will fill his breath as musical notes in that heart. Elated, He broadcasts soul-stirring songs. The air blown through the flute of heart will become spiritual and the universe echoes with it. The bamboo eagerly awaits for the touch of the lips of Lord Krishna and gets transformed into a flute. Like a flute spreading the melody of Lord Krishna in the universe, we can also spread the melodious message of Baba with our deep yearning for universal welfare. It is not just enough to think, "I must become a flute" but practice is essential for reaching that ego-erased, hollow state. Baba will show an easy path to people who feel life burdensome. God will not put burdens on our shoulders which we cannot bear or troubles which we cannot pass through. If the faith in God is proved to be true, He not only gives us the strength to bear the burden happily but will clear the hurdles. He enthuses us to forget tiredness. Although our path is full of thorns, bushes and pits, with an unbearable load on the head and even if none comes to our help, it is enough to go ahead by thinking of God. He takes care that we will not fall down, that our legs will not get hurt by thorns and bushes and thus makes the load lighter by lending us His Invisible Hand. We wonder whether we were really shouldering the burden when we cast it on Baba. Baba will guide us and we can be care-free. When Baba, the Heavenly Father, who protects those who repose faith in Him is with us, where is the need to fear? Baba is the Ocean of Compassion who takes everyone in this world into His arms and treats them with love. Baba is the nectarine cloud that rains incessant love. Those who get soaked in that nectar of Baba's love will acquire the capacity to endure any pain or trouble by the grace of Baba. We should, therefore, cast our burdens on Baba who would protect His devotees from all kinds of troubles and hardships, fears and anxieties. The sensual pleasures, though appear to be heavenly, are in fact, the pits of hell. "If the mind moves towards carnal desires, you draw it back and offer it to Me", so says Baba. If the physical desires are offered at the lotus feet of the Sadguru, the desires will perish on their own. When the mind is aware that the Guru is always beside, it will not behave as it wills. Whenever the physical desires arise, the thought that 'Baba is beside me' will weaken that desire. The practitioner will become ever-vigilant. Then he will attempt to restrain his desires. On seeking shelter at the feet of the God-Guru, on one hand, wisdom blossoms; while on the other, love for the body decreases. Then, one attempts to abide by the words of the Guru. He will treat the problems as tests and offer them at the feet of the Guru. He will never challenge or question 'Maya' or the illusion, but remains a silent spectator. He will believe in Baba with complete faith. A matured devotee will understand the absolute truth that acquiring devotion, wisdom and relinquishing desires are very important. He will realize that the Guru and God are one and therefore renders service to the Guru. Despite, leading a mundane life, he will continue to pray to Baba in his mind. Ultimately, he accepts the truth that it is only at the feet of Sadguru like Sai that one's mind rests in peace. The life work and teachings of Sadguru Sri Sainath are recorded in Sri Sai Satcharitra (holy book). Daily reading of the holy book and deep meditation on the teachings of Sai will ward off our sins. Every devotee has to personally experience the immense relief by devoutly reading the holy book everyday. Generally, people start reading the holy book with the sole object of getting their worldly desires fulfilled. It is good to make such a beginning as every good act had such a start. Definitely one must pray to Baba to fulfil one's material desires. By experiencing a worry-free, worldly life, one would, one day, look to Baba and pray, "Baba! I want to be with You alone". Once a devotee savours the syrup of joy he gets from the constant reading of the holy book, he would think how petty and trivial are worldly desires are and will start reading the book only for the deep divine delight. Reading makes them ponder over the deeper meaning of Baba's teachings and one gets inspired to apply them in one's life. And the day dawns, eventually, when one's mind gets attuned to Sai Love. Then, everything is full of Sai. Parayana, literally means 'to be through with Sai's philosophy'. 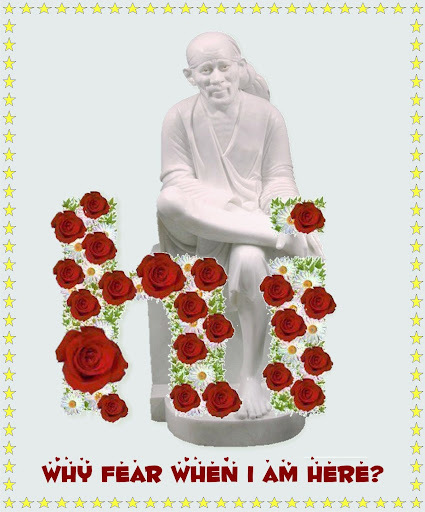 That is to say to cross over the outer meaning of words and grasp the essence of Sai Love in His teachings. This is the result of devout reading of the holy book, Sri Sai Satcharitra. Love alone rules the world. Love is holy, selfless, stain-free and love with integrity and simplicity is the form of God. Human heart is as vast as the Universe. When we churn the human heart, what results in is the golden chalice of ambrosia of love. The love a mother showers on her child and the love God rains on His devotees are too sweet to be savoured. It cannot be explained in plain words. Our true love is expressed, without expecting anything in return, for those whose faces we want to see glow in joy and they prosper and be peaceful. God's love is, indeed, true love. What can we give as a gift to Baba who is the very embodiment of Divine Love? Pure love for Baba is the flower one can offer at His Feet. There are several people in this world who are needy, orphaned, handicapped and suffering from dreaded diseases. Providing the needy with desired help at appropriate time is the true love we can express for Baba. Visiting old-age homes, hospitals and offering food, sweets and other gifts may provide a short-time solace for them. But, the love and concern with which we care for and serve the helpless and the sick is like a cool breeze in hot summer. The service rendered with love to the society will be blessed by Baba and we will be led on the right path to reach Baba's Feet of Felicity. An association is a get-together of people. Generally a person intends to tread a path trodden by the most. If one is among the good, he will naturally select the right path and thereby reap good results. So, one needs sincere practice and the association of spiritually charged souls. This should be cultivated like a garden. Time and again, it should be watered, weeds plucked and plants protected. Hence, we all must assemble, listen to and contemplate on the God-Guru Sai and keep assimilating and applying His teachings and emulate His life of love and good deeds. Spiritual practice is the listening of the stories of God. Valmiki's "Ramayana" and Vyasa's "Bhagavatham" were propagated by his learned disciples throughout this vast country. Thus, even the illiterate masses are familiar with the philosophical truths, epics and right conduct. By listening to such great ideas and getting our hearts purified, devotion and dedication would grow like healthy plants. So, once in a week we should invite our neighbours and make them listen to stories of God's love, do arathi to Sai's idol, pray and sing bhajans, offer food and share it with one and all. The company of such noble souls alone will be our flowery path to reach Sainath Maharaj. A person used to carry river water in two pots tied to the two ends of a pole positioned across his shoulder and used to serve it to the master. One of the pots had a crack. By the time he reached home one pot was full as it was, while the cracked pot had only half of the water in it. One day the leaking pot said, "I am feeling sad. Pardon me. You are carrying the load of two pots with difficulty to such a distance. But I am able to provide only half the quantity of the water". The man felt pity on the pot. Looking at the pot, the man carrying the pots had a hearty smile and said, "Look at the beautiful plants along the path that are blooming fragrant flowers. I offer all those flowers to our master. You have not understood yet. I have been observing the drops of water trickling down from you. So I have planted flower-bearing plants all along the path. They are getting wet by your trickling water and are now fully grown to the extent of giving flowers. You are repenting for giving half of your water, but the beautiful flowers have blossomed because of you" On hearing the words, the leaking pot felt elated and trickled few more drops of water. It is Baba who provides strength or weakness. If we reckon our mistakes and seek forgiveness, Baba will mould our weaknesses into pathways that yield good results. For every individual, a careful reading of sacred books will be highly rewarding. The dormant feelings of heart should be regulated by thoughts of God. As soon as we get up in the morning, we should pay our respect to God, with a grateful heart, and attend to our daily chores. After the morning ablutions, the reading of 'Holy Scriptures' provides us with peace of mind. The sharing of good thoughts that we gather from holy books, with others will be useful for our spiritual progress. Although we are not so competent to read scriptures or Vedas, reading the books available in simple language about the sayings of sages will be similar to the perusal of holy books. By reading such holy books, the picture of God will get embossed on our hearts and thus we long for God-realization. Baba also used to present books like Vishnu Sahasranama, Ramavijayam etc., and used to ask them to read the books. We must remember Sai before we go to bed in the night so that Sai will be pleased and will shower His grace on us. Reading of Holy Scriptures will boost our self-confidence. There will be a remarkable change in our thinking and, thus, our mind becomes pure. We will know ways and means of acquiring Baba's grace. We understand that there is no Master as perfect as Baba and no scripture as good as Sri Sai Satcharitra. Even if a war, agitation, chaos or difficult situation persists outside, Baba protects us with His Divine Power by throwing His hands around us. We, being in His protection, will get rid of fear and pain and find peace of mind. It is common experience to face troubles in life and preventing them is not in our hands. We need a tough heart to weather the storm of struggles. The Grace of God gives us that power. Then, the impact of the external events cannot touch us. Things or expressions of the external world are mere physical and pains from such sufferings are inevitable. Sometimes we feel that we are helpless in controlling such adversities. However, the Omnipotent Baba would bless His staunch devotees to endure pains with ease and calm. Baba makes us wise as to not to torment our minds and hearts by the pain of the harsh times we face. We get totally assured that Baba will set right the things. We reach such a stage that even if the sky falls down, we think; "It's all right! I have not bothered since Baba is there to take care of". Those in the Protective Arms of Baba will be like a grand-daughter reading peacefully nestled in the lap of her grand father without feeling uneasy or troubled. Then, there will be no hurdle for meditation, for reading, for Sadhana. Being in His protective arms, peace would be at heart. That serenity, only Baba can give us. Whenever Baba wanted to serve food to others, He himself used to arrange for everything from the beginning to the end. He would lit fire in the open space before the masjid and prepare food. He had two vessels. The bigger one was meant for cooking food for a hundred, while the small vessel was sufficient for fifty persons. Sometimes Baba would cook sweet rice. At times, He would cook mutton biryani. While preparing soup, He would drop flat bread of wheat flour into it. He would grind all spicy items well before adding them to food. He would make every effort to cook and make the food tastier. Sometimes, Baba would cook porridge. He would not hesitate to dip His hand into the boiling cauldron to test whether it was properly cooked or not. There would be no sign of fear in His face or scars of any burns on His hand. As soon as the food was cooked, Baba would bring them into the Masjid and ask the moulvi to offer it to God. Only after sending some sanctified food to Tatya and Mhalspathy, He would distribute the rest to the satisfaction of the poor and hungry. Baba gets immense pleasure in feeding His children. Those who were fed with the food cooked and served by Baba's hand were indeed virtuous and fortunate souls. Let us cherish in our memory Baba's charity of feeding the hungry and the poor and emulate Baba. The will of Almighty God and collective human effort are the two ingredients of success. A kite flies high in the sky. Why does the kite fly at such a height? The boy flying the kite would instantly reply "Yes, I am the cause for letting the kite fly high". Will the wind be silent? It will counter with the words 'I'. 'It is I alone who am showing right direction and causing it to fly'. The long string in the boy's hand will interrupt and say, "If I am snapped, what does the air do and how can the kite fly? I am the propeller for the kite to fly", so saying it would retaliate. Immediately, the tail of the kite fluttering at the bottom would quibble "what's the use of all of you, I alone did keep it right and it is all due to my effort that the kite does not turn upside down". Yes, for the kite to fly in the air, tail, string and the hand are all equally important. The five fingers folded together make a powerful fist. However arduous the task might be, success can be achieved by collective effort. It is made possible only when everyone shoulders equal responsibility with an honest intent. We, the humans, must know our duty and responsibility and strive to accomplish it with unity, co-ordination and sincerity. Just as a long string makes the kite fly, so does the love of Baba forms the support and the base to our labour and ensures our success. All human beings are the beautiful flowers raised in the garden of God. He is their Protector. Baba used to tell that He incarnated on the Earth to promote our material and spiritual well-being. Hence, whatever actions or duties we perform, they should be offered to Baba in word, spirit and deed. This is known as complete surrender. Every minute we need to observe Baba in our heart. If we could implement the words of Baba in practice, He would definitely make a place for us in His heart. We have to believe in Baba as our everything and live in His Light. On one occasion, a Swami from Alandi approached Baba with a severe ear-ache and sought His blessings. In spite of undergoing an operation, he found no relief. Baba blessed him assuring, "Allah Achha karega", that 'God would cure him'. Keeping faith in Baba's words, he returned to Pune and within a week the pain miraculously disappeared. It is all due to the complete surrender and faith that the ear -ache vanished by the Grace of Baba. Whatever work we do, we should think of Baba and feel that it is Baba who works through us. There should be no feeling of "I" or "mine", except a conscious feeling that it is done as per His Will. Then, there is no possibility of making a mistake. Moreover, the ego, "I am doing" would get erased. We have to seek His protection by our total surrender to Him. The little green plants make the surroundings beautiful and give happiness to people. The lovely flowers, like the hearts of good souls, please the eyes of the on-lookers. Trees provide shelter to many birds. They protect living beings from sun-stroke and comfort them under the shade. The group of trees is called a garden. In such beautiful gardens like the Naimisaranya, several ascetics did penance and became the blessed ones. Likewise, our Shirdi Sainath groomed a garden and named it 'Lendi garden'. On seeing Baba as a gardener carrying a pot-full of water, some saints praised Him as, 'this Great Soul is not for Shirdi alone but a Jewel for the entire World'. In the Lendi Garden, Baba Himself lit an eternal lamp and kept a grill around to safeguard it. He called it an Eternal Lamp that burns out the layers of illusion clouding the human mind. No one can completely grasp the mystery of God. There is as big a difference between Heaven and Earth as between our limited intelligence, thinking and the path of heavenly vision. In order to realize God, either searching Him or singling out His Omnipresence or installing Him in a particular place is not possible. It would be better to desist from such futile attempts. To have firm faith in Baba who is the Living God visible to our eyes and apply His teachings in our lives is the right method. Baba laid emphasis on austerity and purity. Time and again Baba proved that by neither reading the scriptures nor by scientific research or even by dry logic can God be realized. One should give up logical debate, futile research and become an innocent child. Then, our heart becomes pure and selfless and can easily grasp Baba. The taste of sugar will instantly be felt on the palate. No knowledge, test or research is needed. The books on sugar making, scientific principles and equipment can only help produce sugar, but can never reveal its sweetness. Instead of searching for God, it is better to know oneself through soul-searching. Then, Baba within us will be felt. Don't regret that you have wasted time in searching for Baba who dwells within you. Unalloyed bliss can be an experience when you love Baba with a pure heart and sense His presence within you. Page created in 0.346 seconds with 69 queries.